Well, if that didn't seem like it took forever. 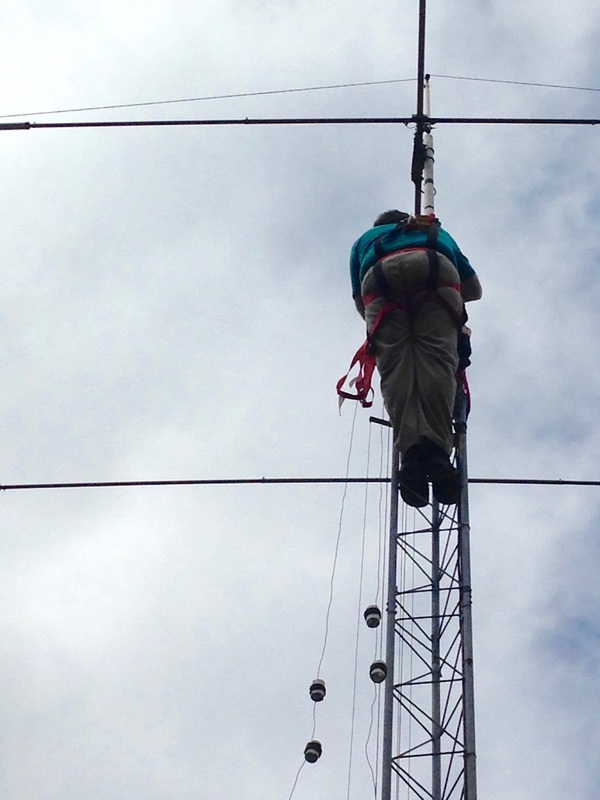 Back in early September, I took down the WARC Dipole. Although I quickly determined that one of the 17m traps was irreparably damaged, I didn't think it was going to take more than a month before I got the antenna fixed and back up in the air. I made two new traps using identical lengths (35.5") of RG-58 coax. I didn't bother to try to trim these to any precise frequency. I just made the two traps as identical as I could, and that seemed sufficient. With the traps back in place I didn't want to re-mount the antenna until I was sure all three bands were squarely in a useful part of the SWR curve. 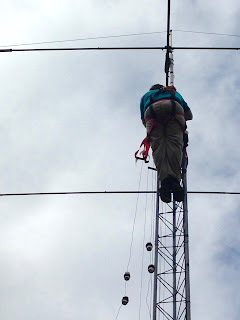 To accomplish this, I used the rope and pulley I had attached near the top of the tower. I used a carabiner through the U-bolt to lift the assembly near the top of the tower. This actually worked pretty well, as I was able to get the apex of the antenna within a foot of it's mounted height. A 55 foot piece of coax allowed attachment to my MFJ-259 antenna analyzer. First measurements showed the antenna to be off on all three bands. That wouldn't do. Since I had originally hacked in the 12m traps to a 17/30m dipole, I hadn't done a good job of making the wire lengths symmetrical. This was contributing to bad SWR at resonance. So my first trimming was to make the two legs equal, and subsequent trims were to both legs. The process goes something like this. Attach the antenna to the carabiner, haul to top of tower. Take rope from one leg and attach it to end of old playground. Pull the other rope through a pulley on the other side of the house until it is above the roof line. Attach the coax to the antenna analyzer, take measurements of resonance and the 2:1 SWR points. Loosen the rope on the side of the house and get the antenna past the roof line. Untie the other rope from the playground. Lower the antenna to the ground. Untangle it all and drag it into the basement so it can be trimmed. Repeat this process. Honestly, I didn't think I would have to do this eleven times! Both 12m and 17m were resonating slightly low, so I carefully trimmed the 12m portion until resonance occurred in the band. Then repeated the process with 17m. Once each band was in the right place, I soldered the connections between the wire and the trap. Trimming past the trap does not appear to affect the inner doublet, which is what we expect. 30m was a problem. It was resonating slightly high. I ended up splicing in about 14" of wire, split between the two legs. This was too much. In the end, I only needed 3 1/2" added, and that only to one unbalanced leg. Managed to work ZD7BG just a few minutes after getting this antenna back up on the tower. It's really nice to have a working antenna again. Now the next repair is to figure out what's wrong with the A3S.